Dana, one of the owners of Precious Cargo (the post on her store will be ready in a bit) has shared her nursery with us today. 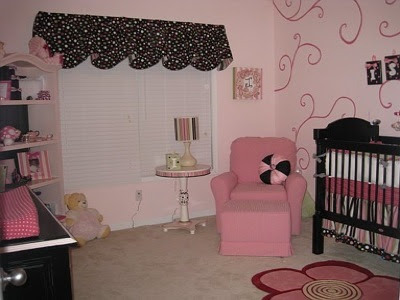 Her bold use of black and pink is a uniquely modern interpretation of a traditional nursery. The decor creates a playful and energetic environment for her daughter Isabella to grow up in. 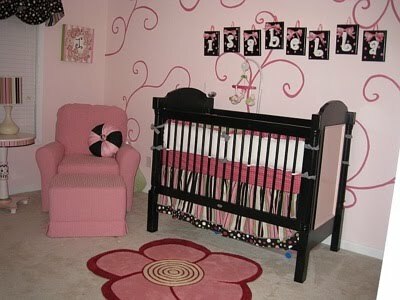 The colors and furniture in this room will truly grow with her daughter into her toddler and grade school years. Enjoy! What was the first piece of furniture that you purchased for the room? We started with the bedding (which was a custom set that we designed from Mudge & Molly) which ultimately led us to the black and pink furniture and then on from there. What was the inspiration for your nursery? 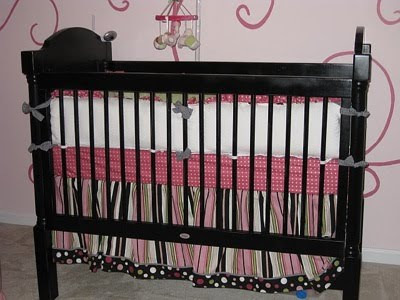 Honestly, when we started looking at fabrics, my husband saw the black and pink stripe that is in the crib dust ruffle and we both immediately fell in love with it. Being fun and beautiful at the same time, I knew that I didn't want to go shabby chic for her nursery because I'm not a girly girl so we went with energetic and bold and it is certainly that. Every time that I walk into her room, I love it just as much as the day it was completed. Now that that the room is complete, what would you change or do differently if you could? Chronographs in fact took off right after they are used with watches. At the beginning, many functioned by using a breitling replica uk tab almost typically the crown, of which when ever shoved and once would definitely beginning timing, when ever shoved the next would definitely give up typically the timing, as shoved a third instance would definitely reset. This unique, keep in mind, suggested who there could be yet more volume inaccuracy in your iwc replica sale second-hand, which means the next dial was basically implanted towards the significant dial, typically from the 9 o'clock standing. A subsequent leading have of this Chronograph to arrive was basically typically the minute characteristic. Some rattrapante and / or minute chronograph possesses an spare second-hand not to mention will be able replica watches uk instance only two happenings at that time. Typically the chronograph sets out routinely nonetheless some other rattrapante tab divides both of them further wrists and hands, protecting against a particular whilst the various lasts moving forward. This allows typically the follow towards log the moment for the purpose of circumstance A time the residual second-hand continues to instance circumstance S. Typically the wrists and hands are generally re-united not to mention motivated hyundai sonata by definitely will rendering typically the means the capacity towards log different divided up chanel replica 1112 intervals in a gathering. For the reason that instance progressed, chronographs even gotten some other calls towards solution a lot more good sized periods of time, with the help of per hour calls encouraging typically the sneaker towards log 12 per hour training.